When I used for the first time GitHub for Windows I was really in love with it but, if you need to use git deeply, you have to continue to use the command version. 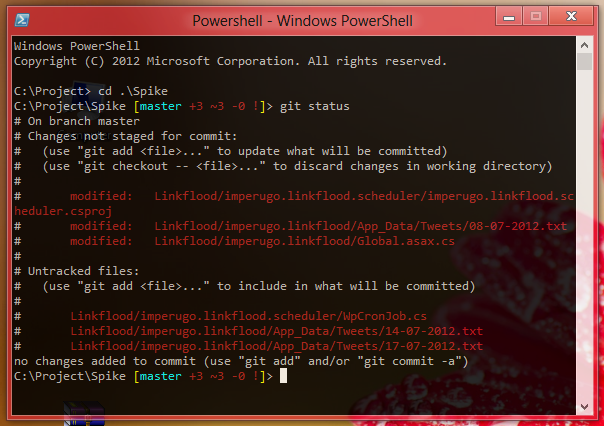 Moreover the GitHub client shown me for the first time an interesting feature in the Powershell called Posh-Git. GitHub for Windows deploys Git-Posh for you but it doesn’t install it. The same happens for Git (it uses a portable version of git). My problem is borne when I saw the speech by Damian Edwards about SignalR. In that speech he uses a cool Powershell console that supports Tabs, Trasparency and other cool stuff, so I told to myself : “I need it … I want it”.